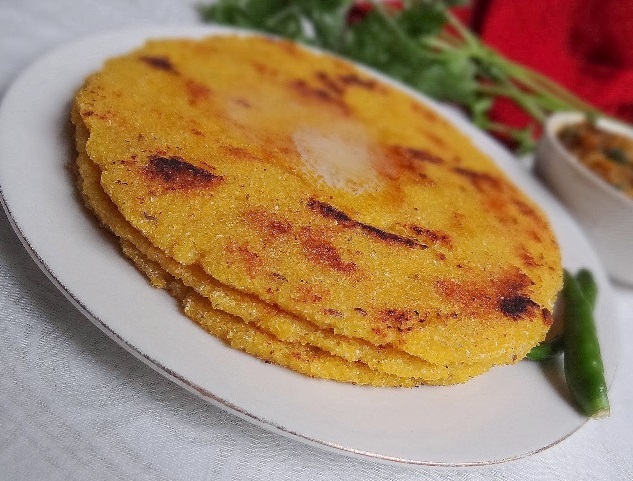 Makki Di Roti: Makki di roti is flat, unleavened Punjabi bread made from corn flour, primarily eaten in Punjab region of Pakistan and India. Like most rotis in South Asian cuisine, it is baked on a tava. It is an important element of the rural Punjabi cuisine. Literally, Makki di roti means “bread of corn” in the Punjabi language. Makki di roti is yellow in color when ready, and has much less adhesive strength — which makes it difficult to handle. Add in half of the water and knead. Add more water as and when required. Rest the dough for about 10 minutes. Make 8 equal sized balls from the rested dough. Heat the tava/griddle on medium heat. Roll the balls using a zipper bag into flat roti’s. Do not roll them too thin as they will break. Roast the makki di rotis on a tava/griddle with 2-3 tsp of ghee till well browned and cooked. Makki di roti is ready to be served. Serve makki di roti topped with butter with hot sarson ka saag. If you have any queries regarding the Makki Di Roti recipe, please leave a comment.